On Saturday night, I received a call from Guillermo Del Toro. The context is a wonderful story, but let’s just cut to the chase – he’s a really great guy. And he’s a phenomenal, consummate filmmaker. 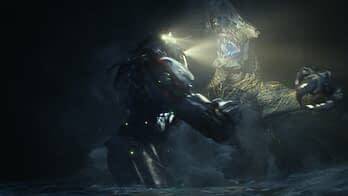 Pacific Rim is about as good a summer action movie as I dare even hope to see. The filmmaking choices are smart, and sophisticated and complex. And Del Toro and I spent a good twenty minutes or so discussing them. What follows is some of what he had to tell me. I hope this gives you some idea of how rich, precise, effective and (not to put too fine a point on it) beautiful his new movie is. It was an eight page pitch. 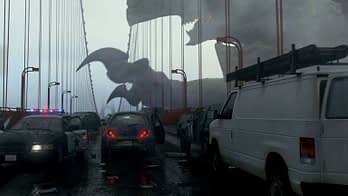 There was the notion of the Jaegars, the notion of the Kaiju, most of the characters, but in a very different storyline. I suggested the two pilots, the neural drift that they use to keep two pilots in sync to control the Jaegers. The first exercise Travis and I did together as co-writers was to create the world. The thing about Travis is that a lot of the terminology, the names and the feel of the movie was already there in those eight pages. Striker Eureka, Gipsy Danger, The Shatter Dome, Stacker Pentecost, Mako Mori… he has a gift for suggesting the outline of a very strong world. He’s a very gifted writer. In my opinion, every work of fiction is political, whether intended or not. I most definitely tried for this movie to function like a normal blockbuster, a big action summer movie, but at the same time, very carefully, I tried to include every character type. The characters in this movie are standard characters in this kind of story – the scientist, the leader, the pilot, the female pilot. I tried to go counterpoint with my development of those characters to how you normally see them in many other summer movies. The first choice I had to make that was a political was “Are we making a movie about a bunch of winners, a jingoistic movie about one ideology, one race? Or are we making a movie about the resistance, a bunch of people who are incomplete, fundamentally damaged?” It’s ultimately about the world saving the world, not just about one country with one ideology. I think it’s a very humanistic message, but hopefully with some of the most amazing action sequences you’ve ever seen. I thought about young audiences very much. My goal with this movie was to make, in a way, the youngest movie I ever made. It’s two hours and one minute as opposed to two hours thirty, it’s a movie that brings to a new generation of kids the giant robot, giant monster movie. I designed it to be very clean and not disturbing but highly entertaining. It has a couple of sequences that are pretty intense, but in a good way. I learned a lot from producing Don’t Be Afraid of the Dark and getting an R when the movie should have been a PG-13. I didn’t want the same to happen to Pacific Rim. The visual design on my film starts with sketches by me but more importantly, and contrary to many directors, I live in the same area as the designers. For the first six months, the designs on Pacific Rim were done in my house, literally in my garage. Oftentimes a director will come to the design department once a week, twice a week. I was talking to them and supervising them six times a day so everything that happens on my film in terms of design very much goes through my filter. Whether it’s one button in wardrobe or the design of a huge architectural piece, I supervise everything. I am obsessive about controlling every audiovisual aspect of the movie but with a very good group of collaborators. Everything counts. Every single choice counts. 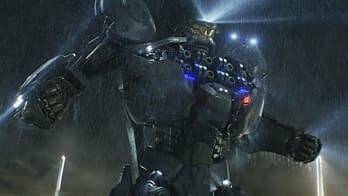 Anyone curious about the design aspect needs to buy the art of Pacific Rim book and listen to the audio commentary on the DVD and the Blu-ray because between the two you start to fathom what was, essentially, a twelve month period of design labour. It’s impossible to condense because every single decision counts. And as I often say, I don’t do eye candy, I do eye protein because all of these design choices are telling the story. On the other hand, Raleigh is in a colour space made up of greens, browns and amber. When they meet, the whole sequence is a meeting of his amber and her blue. You see that the entire scene where they meet at the helipad is a clash of just blue and amber. Mako and Raleigh complement each other, their colours are complementary. Their Jaeger cockpit, then, is mostly in blue and amber, their colours. And finally, they recuperate the heart. There’s a scene where they’re watching the robot in a service station and for the first time, the technicians uncover the heart of the robot. Mako and Raleigh are becoming vulnerable. And this is resolved, finally, by the reintroduction of the full red colour when they are together under the ocean. It’s colour coding, it’s art directing, it’s wardrobe designing and it’s telling the story at a very visual level. I don’t expect the audience to notice these things, and I don’t expect the critics to notice these things, but if you ask me, I can literally decode the entire movie visually and you will see that every texture and every colour and every shape is part of the storytelling and the journey of the characters in the story. I’m very proud of the 3D conversion and it’s my preferred version of seeing the movie, the 3D. People that have the bad taste of sloppy conversions to 3D should see the movie and see what I think is a really careful conversion and how something can be really good in 3D. I was very sceptical about 3D. The real 3D conversion was my conversion. And I converted to believing that you can do a phenomenal job in conversion. The probably is normally, I suppose, is that directors aren’t that involved, or there’s not enough time or not enough money. I asked to get involved and I dedicated myself to it. Every single shot in this movie was approved by me, or not approved by me – many shots were sent back ten times, fifteen times, twenty times until they worked to my satisfaction. I 100% endorsed the 3D conversion and urge people to seek it out. And whenever I have the means of presenting a movie in 3D I will do conversion with an equally extensive amount of time and care. Another factor that was not talked about as much was how part of the battle was to get enough money to pay ILM to generate a huge proportion of their plates in native 3D. Many, many minutes of the movie, at least 30 minutes, are native in the effect. 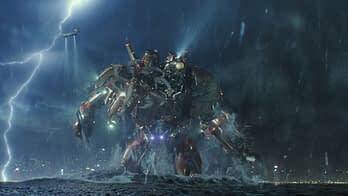 When you have a completely digital plate, ILM have generated the robot, the background and the Kaiju, from the start in 3D. I made an agreement with Stereo D, the conversion house, and said “Look, you’re converting a movie for the director, the filmmaker, not for a studio, so you’re not going to create a fake sense of 3D.” We went to almost zero 3D with shots of the giant monsters and robots, except for the rain and objects in the foreground. We didn’t violate the scale of the fight by forcing the robots and Kaiju to 3D which would have miniaturised them. They are almost an absolutely flat image, with some foreground. 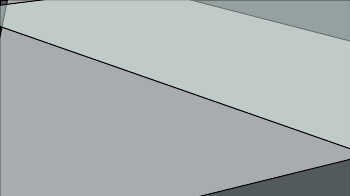 You normally end up variating the 3D a little bit, cheating here and there. That’s one of the good things about doing it in post, you aren’t setting the 3D on set and then having to fight that. Since we were doing the 3D conversion, I decided to take a more 3D approach to the sound mix than ever. Especially for Atmos theatres, which has more of a 360 sound system, the movie is constantly involving you. I have little Atmos scenes in the surrounds, shouts in the background, the movie is very 3D in its mix. When we were beginning the movie we started by basing the sound on reality. For example, we collected sounds from NASA, from the launching of a Saturn rocket to the sound of the shuttle as it moved into position, and we used them in the Shatterdome, the Jaeger station. In designing the sound of the Kaijus we used, as I always do, my voice as part of three or so of the Kaijus. Then we started recording real animals, including some animals that you’d never guess, including Raccoons. They turned out to be very useful, and have a horrible growl that we cut in a lot, pitching it down. We even used some handmade children’s toys that I remembered from my childhood. We reproduced them because they made this little clucking noise like a chicken, took the sound to a super hi-tech studio, recorded them and pitched them down, slowed them down, and there’s a little bit of that in the Kaiju also. 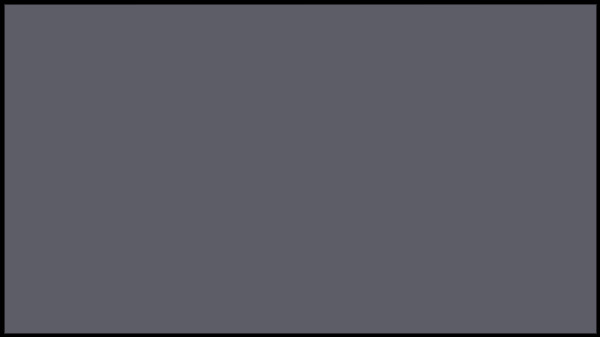 The Jaegars are composited out of three or four layers of sound. The action sequences we’ve created, at least in scope, clarity and spectacle are the best I’ve ever done, certainly, and amongst the best that can be expected from any movie. 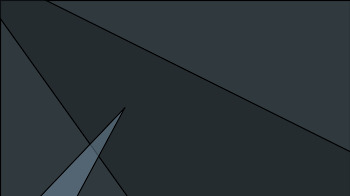 I was completely conservative about the axis [the line of screen direction] and not only in the fights – in the fights we always know who is on the left, who is on the right, which robot is facing which Kaiju and all that – but also was very specific about, for example, The Shatterdome’s position in relation to Hong Kong. You’ll always know that when the Shatterdome is facing the ocean, Hong Kong is to the right, the Shatterdome is to the left. Any time somebody comes out to the heliport, the helicopters are going to be travelling left to right, the Jaegers will be heading left to right. The macro geography of the storytelling was equally specific. I wanted people to be in an unfamiliar world of colour and almost fantasy super-saturated images, but be very grounded in geography and being able to follow a master shot rather than a bunch of cuts. We deliver the spectacle with very majestic shots, very rational, almost classical fight cutting. We are not disrupting the axis or becoming super cutty. Hopefully people will enjoy this too. 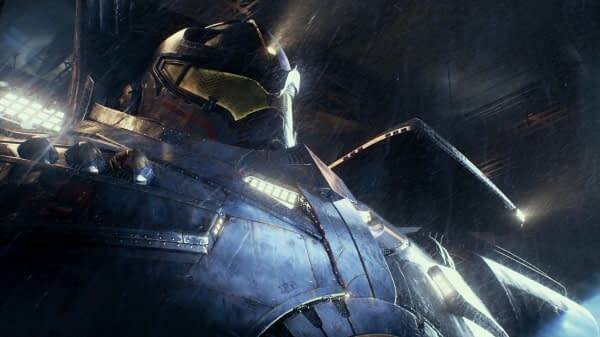 Pacific Rim opens in the US and UK on Friday July 12th. I can’t thank Guillermo enough for taking the time to talk to me, but you could show him some geek love for turning out for his film this weekend.